Barbara Cook, gifted with a clear, beautifully toned lyric soprano voice and ingenue good looks, was a megastar of the Broadway musical stage for a decade in the 1950’s and 1960’s. She created three important roles in the American musical repertoire: Cunegonde in Leonard Bernstein’s Candide (1956), Marian the Librarian in The Music Man (1957), and Amalia in She Loves Me (1963). Cook later shifted gears and has since performed primarily in concerts and cabaret, with an emphasis on the Great American Songbook. In her first San Francisco appearances since the 1970’s, Cook is offering a Mostly Sondheim program, based on the concept of Sondheim’s 70th birthday celebration concert last May, which featured not only songs by Sondheim, but also songs that "he wishes he had written." It’s a marriage made in heaven–but sometimes heaven takes its time. Although Cook’s rendition of "Losing My Mind" was a show-stopper in the 1985 Follies concert at Avery Fisher Hall, she hasn’t returned often to Sondheim material. Onstage she refers to the songs with a degree of awe as "art songs." But Cook’s natural, seemingly effortless vocalizing along with her intelligent delivery of lyrics seem ideally suited for the sophisticated musical constructions and wise, witty lyrics of Sondheim. Accompanied on piano by her longtime musical director Wally Harper, with Jon Burr on bass, Cook opened for a demonstratively appreciative audience with an upbeat "Everybody Says Don’t" from Anyone Can Whistle. Utterly confident and equally unpretentious, Cook chats about her material between songs, offering interesting background and some humor in the bargain. She’s equally effective at a bluesy, regrets-song, like Harold Arlen and Johnny Mercer’s "I Wonder What Became of Me," or their "I Had Myself A True Love," a lost-love number in which Cook shows she still has the power to belt out a line. Cook brought on a surprise guest, Malcom Gets (best known for Caroline in the City), and together they did a sweet love duet, Arthur Schwartz and Ira Gershwin’s "There’s No Holding Me." Gets gave Cook a chance for a breather while he accompanied himself at the piano in "Another Hundred People" (Company) and "So Many People," from Saturday Night, a show Sondheim wrote in the 1950’s, never produced in New York until a brief run this year. Cook continued with two superb numbers from Passion, "Happiness" ("I’ve never known what love was and now – so much happiness…") and "Loving You" ("Loving you is not a choice, it’s who I am."). Changing the mood again to the upbeat (credit Harper for an impeccable sense of pacing), the still funny and frothy "You Could Drive a Person Crazy" preceded a medley of "Not a Day Goes By" (Merrily We Roll Along) and "Losing My Mind." 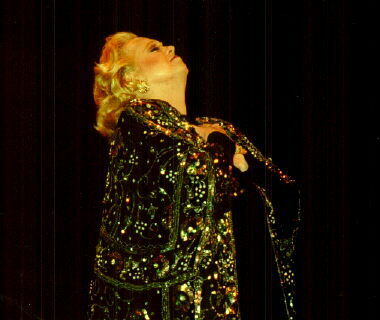 In the second half, Cook’s offerings ranged from Irving Berlin’s "I Got Lost in His Arms" ("a perfect song…" she said, "I love to swim inside of that song.") to an amusing "Hardhearted Hannah" to her big song from She Loves Me, "Ice Cream." In the latter, Cook hit a high note with operatic force and surprising accuracy–you ain’t supposed to be able to do that at 73. She accomplishes this, she says, with "a visualization trick. Hell–if it works for pole vaulters, why not me!" No one expects from Barbara Cook the bell tones of her youth. If the years have taken some edge and power from her instrument, the same years have enabled her to acquire an accumulation of musical skills, a breadth and depth of knowledge of her songbooks. Her phrasing and diction are unsurpassed in the business and her relaxed, poised stage manner grows out of confidence and long experience. For all the skill that Cook brings to her performance, though, she still makes it look and sound easy, natural. Her art makes her seem artless. And that apparent artlessness accomplishes a small miracle: Barbara Cook is a convincing ingenue at 73.